BBC BASIC uses a different keypad layout to the TI-OS to try and make typing BBC BASIC easier. The following diagram illustrates the function of each key. When using the TI-OS you would use the 2nd and Alpha keys as dead keys; press either of them once followed by the key that you wish to modify. Within BBC BASIC they are replaced by Shift and Alpha modifiers; you need to hold them down when pressing the key you wish to modify. By default, each key types the uppercase letter that is printed above it. To type the lowercase equivalent, hold down the 2nd key whilst pressing the key. Holding Alpha will type a number of symbol of some description - in the diagram above it's the number or symbol above the key, to the left. 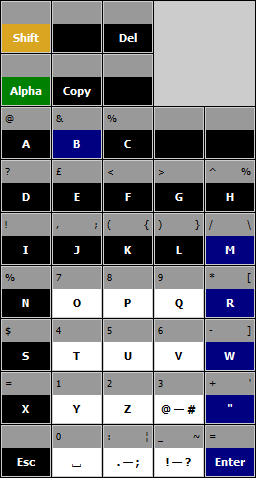 Finally, holding 2nd and Alpha down can be used to type some extended symbols, which appear above the key and to the right. Using copy key editing to correct a mistake in a program.